A number of Irish whiskeys are matured or finished in wine casks. This St. Patrick's Day, find out why your whiskey has likely soaked up its share of wine. St. Patrick’s Day is a perfect excuse to set down your glass of wine and raise a dram of Irish whiskey. What you may not realize, though, is your whiskey has likely soaked up its fair share of wine, too. A growing number of Irish whiskeys have been matured or finished in casks that previously held wine. 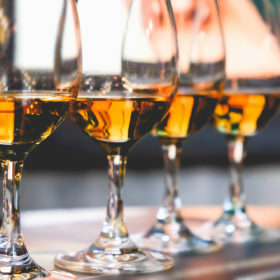 Although it’s become more common for whiskeys to spend a little finishing time in Sherry or Port casks, Irish whiskey seems to be particularly promiscuous. Shelves now carry Irish whiskeys made in barrels that previously held Madeira, from Portugal, and the much less frequently seen Malaga, a fortified wine from Spain. It’s not just fortified wines, either. Scanning Irish whiskey labels feels a bit like looking over a wine list, turning up Bordeaux, Cabernet Sauvignon, white Burgundy and even Sauternes. What’s going on? “Irish whiskey is a fairly good canvas to accept flavors from wine casks,” says Alex Chasko, master distiller with Teeling, which has been at the forefront of aging Irish whiskey in former wine casks. However, he says that the wine casks need to be selected carefully to ensure quality. “You want something that has a crisp, clean nose, and that has a distinct flavor that’s not going to muddy the underlying whiskey flavors,” he says. Teeling produces a single-grain bottling fully matured in former California Cabernet Sauvignon casks, and a 24-year-old single malt Irish finished in a Sauternes barrel. The distiller also makes a single malt made of a blend of whiskeys finished in five separate wine casks, then married together. To hear Chasko describe it, the whiskey almost sounds like a box of paints, artfully dabbed together to create the perfect color. “We started with the nose,” he says. “We liked the white Burgundy for the tropical fruitiness. Then we layered on top of that Madeira and Port, trying not to destroy the fruity nose, but bring in a bit of spice and red fruit into the taste. Another notable example is the limited-edition Green Spot Château Léoville Barton, a pot-stilled Irish whiskey finished for 12 to 24 months in casks that previously contained Bordeaux wine from Château Léoville Barton. Don’t expect it to taste like your favorite red, though. It’s a grassy, bright whiskey with notes of baked pear and a subtly smoky finish. Certainly, there’s tradition behind the trend. Spirits producers have historically taken a waste-not, want-not approach to aging, and there’s a long history of recycling used barrels to add a bit of flavor, whether those casks previously held wine or a spirit like Bourbon. Longstanding relationships between producers (sometimes within a parent company) can also play a role, often to delicious effect. One example is Redbreast Lustau, a collaboration released in late 2016 between the master blender at New Midleton Distillery and winemakers at Bodegas Lustau. Sherry comes into play twice: first, the whiskey spends nine to 12 years in a combination of former Bourbon and Sherry casks. Then the whiskey spends an additional year in Spanish oak oloroso Sherry butts from Bodegas Lustau. All together, it’s a special-occasion whiskey worth seeking out: complex and suggestive of dried fruit, apple butter and spice sweeping into a rich, creamy honey finish. While other whiskey categories have been using wine finishes lately (especially Sherry), it seems like the Irish category has been dipping into wine barrels with increasing frequency. What’s behind this wine-soaked streak? Chasko says it might just be that as an underdog category, Irish whiskey producers have been forced to try different things. By contrast, Chasko says, Irish whiskey has seen growth in the last 15 years, and it’s incumbent upon the industry to find ways to sustain that momentum. “They are trying out new things, new innovations to keep people interested in Irish whiskey,” he says. Tullamore Dew Single Malt 18 Years Old; $110, 94 points. A quartet of casks (Bourbon, Sherry, Port, Madeira) provide a spice cake-like sipper that finishes with rounded toffee, cocoa and spice. Yellow Spot Single Pot Still Irish Whiskey Aged 12 Years; $110, 94 points. Aged in former Bourbon, Sherry and Malaga casks, look for a robust, spiced palate tinged with brown sugar, golden raisins and baked pear. Green Spot Château Léoville Barton; $100, 93 points. A limited-edition offering, this Bordeaux-finished whiskey mingles grassy brightness with baked pear and a subtly smoky finish. Redbreast Lustau Edition; $70, 91 points. Time spent in former oloroso Sherry barrels yields big, spicy dried fruit flavors and a rich honey finish. Teeling Single Grain; $50, 90 points. Rose-gold in the glass, this whiskey is finished in former California Cabernet Sauvignon casks. The palate suggests nuts, custard and vanilla, with just a fruity tinge in the aroma. The Tyrconnell 10 Year Old Port Cask; $75, 90 points. This single malt shows plenty of stone fruit: plum and dried apricot layered with almond, plus hints of smoke and clove in the finish.